1 cup bell pepper chopped (we prefer red or orange). 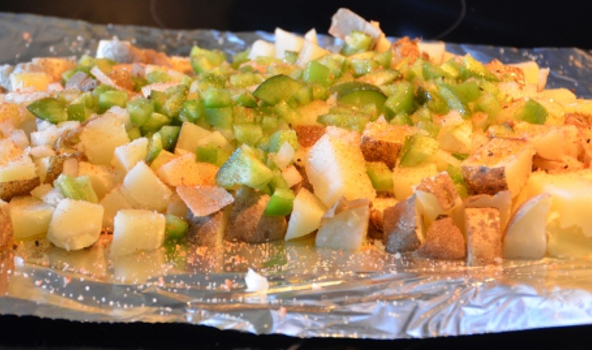 For each packet, measure 2 or 3 squares of aluminum foil large enough to easily wrap the potatoes, and layer one on top of the other. Place some of the bacon in the center of the foil. Then layer the potatoes, onions, chopped peppers and dot tope with butter. Sprinkle with Mac Yourself™ cheddar cheese powder, salt, pepper and garlic powder. Wrap the foil around the potatoes and seal edges. Repeat with remaining bacon, potatoes, onion, peppers, butter and spices. Place foil wrapped potatoes over indirect heat and cover. Cook for approximately 30 minutes, (or until potatoes are done) turning once. Serve hot off the grill.